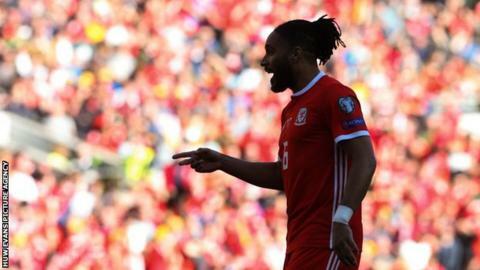 Wales manager Ryan Giggs says Ashley Williams will keep the captaincy despite dropping him for the Euro 2020 qualifying win over Slovakia. Giggs picked Anderlecht centre-back James Lawrence ahead of the 34-year-old, who came on for the final 17 minutes of Sunday's 1-0 victory. Gareth Bale led Wales in Williams' absence but Giggs denied that was a permanent switch. "No, Ash is still the captain. You're never going to take it well," he said. "He didn't sulk. You don't want players to take it well. You've seen what he brought when he came on - the leadership qualities." Williams, who is on loan at Stoke from Everton, has been in and out of the Potters' side this season, and Giggs said his lack of match fitness was the only reason he was benched. "I talked about it all week, with the advantage we had physically I wanted every player to be playing regularly," the former Wales and Manchester United captain added. "That was the only reason. We gave him 60 minutes [in Wednesday's friendly win over Trinidad and Tobago] and I wasn't too sure until yesterday. "It wasn't a case of ruthlessness. It was trying to pick the right team and physically having the team right. "It was the only position where I was deliberating. He came on, saw us home and is part of the plans going forward." Williams' cameo from the bench was his 85th appearance for Wales, moving him level with Gary Speed as the country's third most capped player. "It's obviously disappointing not to play but it's about being ready whenever you're needed to get over the line," said Williams. "He explained it [the decision], he's the manager and he makes the decisions. Obviously I'd like to play and it's frustrating but he's the manager and you go with it." Although Williams was frustrated not to start, Giggs believes he played an important role as Wales repelled late Slovakian pressure to win on Sunday. "Coming into the week I wanted two clean sheets," he said. "Without Chris Gunter [against Trinidad and Tobago] that doesn't happen. Without Ashley coming on and seeing us home and without Wayne Hennessey [against Slovakia], that doesn't happen. "When you are older you can also learn from the younger players. We have got talented young players but also we can't do it without the experienced players. "And it's not easy leaving those experienced players out, it's not easy at all." Sunday's win over Slovakia was a significant one for Wales, who are aiming to qualify for a second successive European Championship but only a third major tournament in their history. Giggs' side, who are the second seeds in Group E, took the lead inside five minutes thanks to Daniel James' fine strike but they lived dangerously in the closing stages. Wales defended stoutly to cling on for what could prove to be a crucial win against Slovakia, the group's third seeds and potentially their closest rivals for one of the two automatic qualifying places. "It was the perfect start really. A clean sheet, three points," said Giggs. "There was a bit of pressure on us. I tried to play it down beforehand but you can't hide from the fact the other teams have played and that Croatia and Slovakia got three points. "We are going to learn from today because we were put under pressure at the end. I challenged the players to keep more clean sheets because we feel with our attacking talent we are going to create chances, we are going to score goals. "It's going to make it more important that we do keep clean sheets."